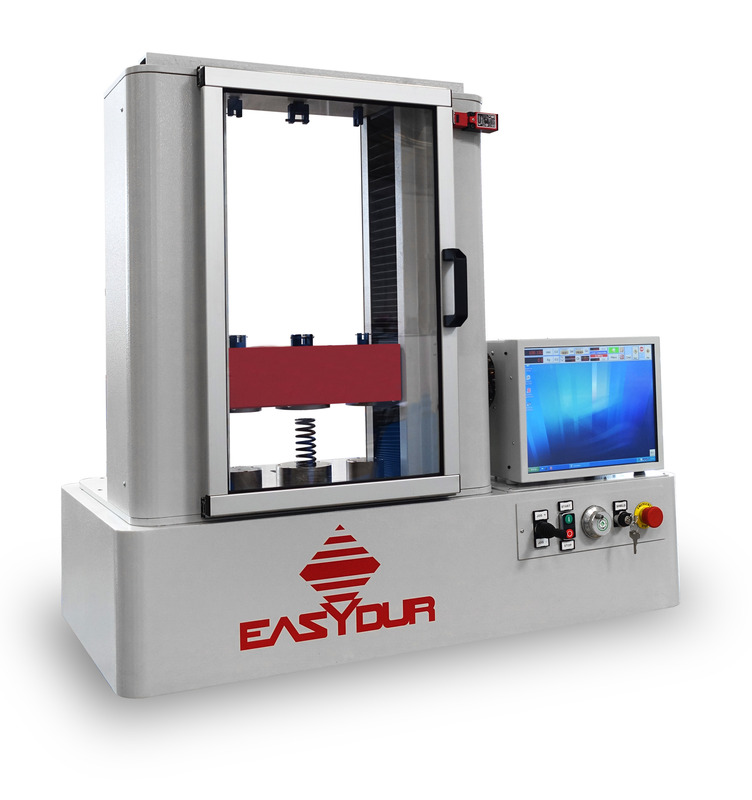 It is a universal testing machine capable of carrying out tensile, compression, bending and shearing tests. Operation is manual, semi-automatic, and automatic. The test instrument can be modularised taking into account that the structure can house 3 permanently installed load cells for compression tests, and tensile grips for tests, including at break. Our system uses several cards (for axis and cell reader control) that are connected via CanBus to enable displacements to position or force at a feedback speed of 1000 Hz. Load cell reads are effected 1,000 times per second. Minimum indexing is 1/32.700 (this can be increased by slowing down load cell reading). The universal testing machine operates with computerized numerical control and includes a computer with HDD and touch screen. It is a self-supporting, two-pillar structure with ball screws. It enables cycles of stress of sinusoidal form which result in machine preservation and remarkable performance – notwithstanding the ball screw mechanism. DC motor drive. The computer programme for this machine has entirely been developed by Easydur based on Windows, with statistics and certificate management in Excel format, which allows users free modularisation and customisation. Up to 8 load cells can be inserted in the machine, 3 of which are permanently installed. Loads can be combined, at will, from 10N to 5000N. Load cells are selected via software and are constantly protected from overload, including when not in use. In the event of an unpredicted shock or out-of-scale condition, the axis will automatically unlock. Integrated load cell yield compensation. Ease of use: each test can be easily performed by using the keys on the front panel. There is no need to access the preset programmes. interface for external data acquisition, e.g. gauges, comparators, etc.